As a big fan of historical epics, I love Robert Wise’s The Sand Pebbles, starring Steve McQueen in his Oscar-nominated role as Jake Holman. (At the age of 15, and a big fan of McQueen in The Great Escape, I remember how excited I was to watch the Oscars for that year.) Set in China in the 1920s as Communists and Nationalists vie for control of the vast country, this 1966 film explores the issue of imperialism and pointedly draws parallels to U.S. involvement in Vietnam. Thrown into this confusing turmoil are the crew of the U.S. gunship San Pablo. 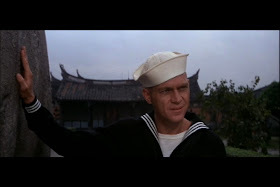 Called “the Sand Pebbles, the American sailors conduct drills aboard the ship, deliver mail to the embassy, and visit a local brothel where they drink and brawl and think nothing of their presence in a foreign nation that does not want them. Jake Holman is the newest crew member and somewhat of an outcast. Forced into the Navy after an incident in his youth when he impulsively beat up a teacher, Holman just wants to spend time with the engine he is signed on to run. But his unwillingness to accept the use of Chinese coolies as assistants causes friction with his fellow crew members. McQueen well deserved his nomination for his portrayal of Holman. He creates a simple soul who just wants to be left alone. In one scene straight from the wonderful novel by Richard McKenna, Holman actually talks to the ship’s engine he loves to work with. When he first arrives on the boat, he lovingly adjusts valves, wipes pipes, and declares. “Hello, engine. I’m Jake Holman.” This might be the type of language that works in a novel but should probably be left out of the film version, but McQueen puts touching believability into his delivery and it works. McQueen’s natural taciturnity also works well as he portrays Jake’s relationship with a demure American missionary named Shirley Eckert, played by the beautiful Candice Bergen, whose acting ranges from stilted to naturalistically sincere. Jake's shyness and his attempts to smooth over his rough ways in the presence of a straight-laced Christian missionary provide endearing moments. 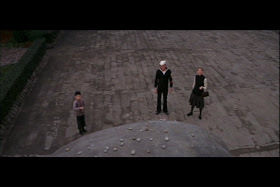 In a two scenes in which Jake shows Shirley aspects of Chinese culture, McQueen reveals his very touching side. His speech is awkward but warm. 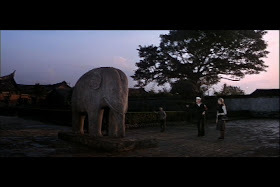 In the scene in which Jake attempts to win a wish by tossing stones onto the back of an elephant sculpture, we see that charming sense of playfulness that always shines through McQueen's acting. In the film clip below, watch Steve turn and look at the Chinese street urchin who has bested him. Even from afar, the whole stance of his body is unmistakable, inimitable McQueen. McQueen also clearly portrays Jake’s moral dilemma, a conflict reminiscent of A Farewell to Arms: continue participating in his country’s imperialistic monitoring of China’s politics or jump ship and join Shirley at the missionary. As Jake waffles, we see inner conflict in his eyes, though if you had Bergen’s tear-filled blue eyes beckoning you, you’d jump ship right away. 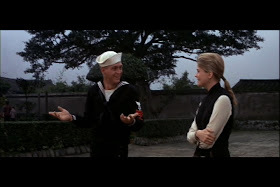 At times The Sand Pebbles is weighed down by subplots: Jake must train a new Chinese mechanic named Po-han (Mako) who is later cruelly tortured by the Communists to provoke an incident; and Jake’s buddy Frenchy Burgoyne (Richard Attenborough) falls in love with a brothel “hostess” who needs rescuing. But the film is kept dramatic by means of detailed art direction showing crowded Chinese ports; picturesque river locations captured by cinematographer Joseph MacDonald (Taras Bulba, Viva Zapata! ); and tightly cut action sequences edited by William Reynolds (The Sting, The Godfather). Additional texture is provided by Jerry Goldsmith’s musical score with themes ranging from brooding to romantic to heart-thumpingly thrilling. Location, cinematography, and editing work together especially nicely to produce a battle sequence that is one of my favorites of all time. After a shameful loss of face and a near-mutiny during a threatening political crisis, the officers and crew attempt to win back their pride by steaming up river, breaking through a boom blocking their way, and rescuing American missionaries. (Ironically, the missionaries don’t want to be rescued and the whole episode emphasizes the futility of the conflict Jake Holman contemplates deserting.) This wonderfully filmed, dramatically edited fight at the boom will be examined more closely in a later contribution to the Steve McQeen Blog-a-thon presented to you by Jason Bellamy at the Cooler. This is an excellent review, and you've picked some great screencaps. One of your opinions rings very true--the idea of "playfulness" in McQueen's acting. As Jason noted in his blog-a-thon announcement, some have criticized McQueen's limited range; however, in the bulk of his films, he seems to have at least one defining scene in which he gives a sly half-smile or genuinely radiates joy in being in a tight or troublesome spot. Jamie - Thanks for your comment. Of course, McQueen has more playful moments in The Great Escape - The Sand Pebbles is more serious. As Hilts he can be a jokster - during the 4th of July celebration - and quite devilish sometimes - when he argues with the commandant. * “Hello, engine. I’m Jake Holman.” This might be the type of language that works in a novel but should probably be left out of the film version, but McQueen puts touching believability into his delivery and it works. If you asked me to pick one scene from McQueen's career that absolutely, positively shouldn't work but does, it would be this one. By a mile. As you say, it's the kind of scene that works OK on the page but that could be problematic on screen, particularly for McQueen, who lacked confidence in scenes of verbal emotion. But, darn it, I get goose bumps every time I see that scene. It just works! * At times The Sand Pebbles is weighed down by subplots. Yes! The whole boxing conflict/scene goes on far longer than necessary. Cut that thing in half (at least) and this is a much more powerful film. * I have some thoughts on the "wonderfully filmed, dramatically edited fight at the boom" ... but I can save those for the later post. Looking forward to it! Thanks for the comments and congratulations on spurring an amazing exchange of material on Steve McQueen - a very attractive, magnetic topic for a blogathon. Holman talking to the engine gives McQueen and the film depth of characterization, which is partly the reason behind making a 3 hr epic like this. Without it, it would just be another 2 hr action flick. Robert Wise said years later that the Maily thing went on too long. (Nowdays we would spell her name Mai Li) Arguably McQueen's finest dramatic performance, he and the film were overshadowed by the Academy having one of their British years when it came to giving out the Oscars. However, it's an iconic role in an iconic film from the 60's. Thanks for the comment - I'm glad you agree it's an iconic 60s film. I agree. It fits right in there with those 60s films that have a visceral, sometimes disturbing edge to them that make them so achingly memorable. I was an impressionable teen in the 60s so those film really struck my soul indelibly. All thoughtful and civil comments are welcome.